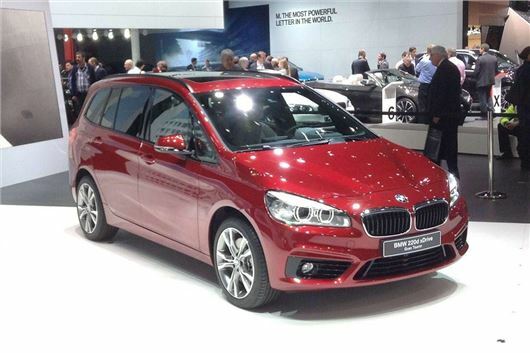 BMW has launched a seven-seat version of the 2 Series, called Gran Tourer, at the Geneva Motor Show. Sales of the new model will start in the UK in autumn, with prices expected to start at around £24,000. Much of the design of the 2 Series Gran Tourer is shared with the current Active Tourer model, including front end styling. However the Gran Tourer has a taller roofline and is longer, with an additional row of two seats. The middle row of three seats can be slid forward and back to liberate more leg room or luggage space, plus there are Isofix points for three individual child seats. The seats have a 40:20:40 split and can be folded with a single button press, giving 1905 litres of space. Luggage space with the middle row of seats in place and slid fully back is 645 litres. The rearmost row of two seats folds flat into the boot floor when not in use, as with most seven-seat vehicles. BMW will launch the car with a choice of five engines – two petrol and three diesel. The range-topping 220d will get xDrive all-wheel drive. Emissions figures are subject to change, but BMW claims the cleanest models will manage official fuel economy of 72.4mpg, with emissions of as low as 104g/km. Detailed UK specifications and pricing will be announced nearer the car’s arrival in dealerships from autumn 2015.
hideous , what are BMW thinking ?? ?